In 2001, the University of Delaware received a large gift of paintings, works on paper, photographs and sculpture from collector and philanthropist Paul R. Jones (1928 – 2010). A lifelong public servant, Jones began collecting art in the mid-1960s, and focused his attention on acquiring works by African American and African diaspora artists—artists who were, at the time, often marginalized and excluded from major museum collections and exhibitions. Jones eventually amassed one of the largest, privately owned collections of African American art. By donating a portion of his collection to UD, Jones affirmed his determination that these works would provide an avenue for people to learn about African American art as part of American art history. 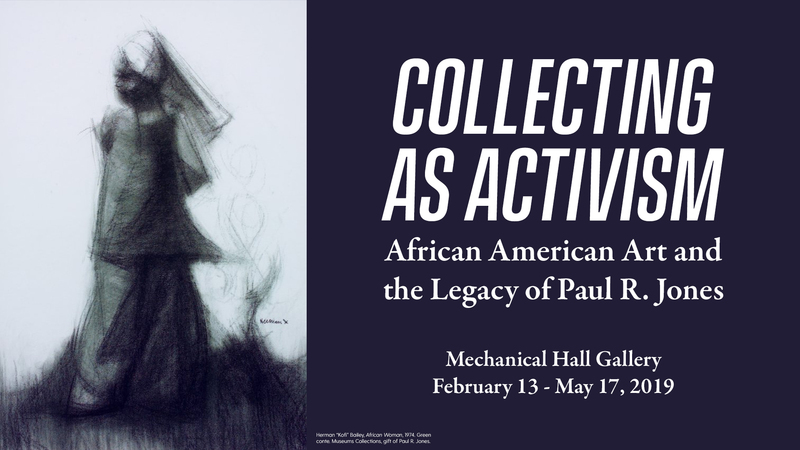 Highlighting the social consciousness that characterized Jones’ collecting practice, this exhibition fosters a critical dialogue about the representation of African American artists in museums, and the legacy of individuals who fought marginalization through the collecting of art. Through the diverse artworks on view—including work by Romare Bearden, Charles White and David Driskell, as well as lesser-known artists like Herman “Kofi” Bailey and Amos “Ashanti” Johnson—this exhibition creates space for artists of color. It invites visitors to ask questions surrounding diversity, inclusion and visibility in art museums, as well as the role of collectors in supporting underrepresented artists, both then and now.